ACTION: Chaffin's Farm (Fort Harrison) VA.
RANK/UNIT: 1st Sergeant, Co. D, 5th U.S. Colored Troops. CITATION: "Took command of his company, all the officers having been killed or wounded, and gallantly led it." MEDAL PRESENTED: 6 April 1865. BIOGRAPHICAL DATA: Born: Medal says Delaware County, OH., Edward Bearss says Indiana, PA. 1838. ENTERED SERVICE: Medal says Indiana County, PA., Edward Bearss says Trumbull County, OH. 4 July 1863. OTHER: James Bronson was a 25-year-old barber when he joined Uncle Sam's army. He stood 5'9" tall. Although promoted to 1st Sergeant on August 22, 1863, Bronson later requested to be reduced to the ranks and reassigned to the regimental band. His request was granted on November 30, 1864. Bronson was mustered out of service at Carolina City, NC, on September 20, 1865. SOURCES: 'Medal', p. 40; Edward Bearss. 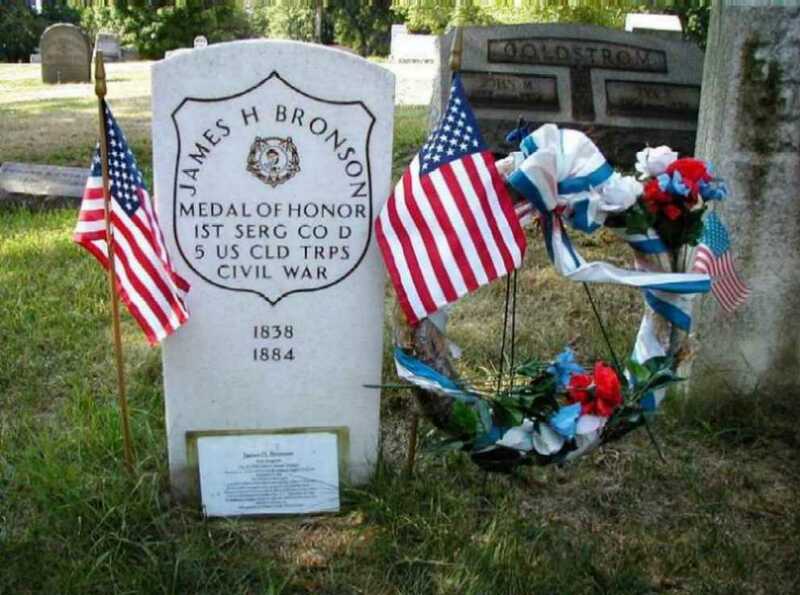 Located in the GAR plot at Chartiers Cemetery is James H. Bronson, who was a black Medal of Honor winner for his actions as a 1st Sgt. 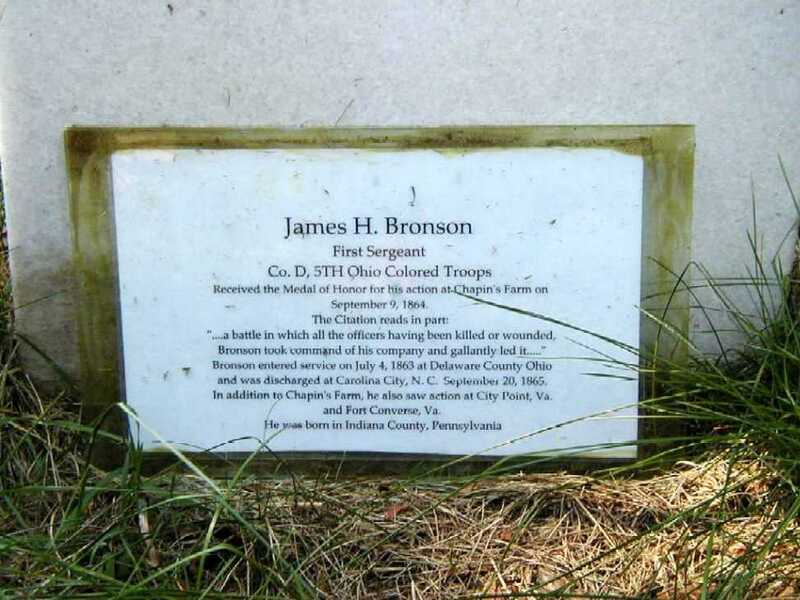 in Company D, 5th US Colored Troops, at the Battle of Chaffins Farm, VA. Bronson was born in Burrell Township, Indiana County, in 1838. He moved to Pittsburgh, were he was a barber by trade, prior to his enlistment at age 25 on July 4th, 1863. 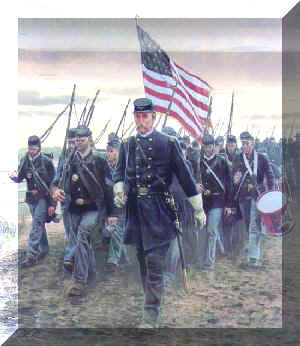 In the 1864 seige of Petersburg, Bronson's company participated in one of the first key strikes against Confederate defenses between Richmond & Petersburg. The assualt, known as the Battle of Chaffin's Farm or New Market Heights, was a vicious fight with no significant outcome. Bronson's regiment stormed Fort Harrison in the face of devastating fire. His company lost all senior officers in the initial attack, leaving Bronson in command. He led his company to within 100 yards of the fort before abandoning the assault under withering fire. He received his Congressional Medal of Honor for gallant leadership under fire. Shortly after the battle, Bronson requested and received a reduction in rank so that he could be assigned to the regimental band. He mustered out on September 20th, 1865 at Carolina City, NC, and returned to Pittsburgh. Thanks to Mike Anthony for the text ~ 5/3/2001.